and with it brings another Giveaway!! The stamping world is blowing up these days and I have to say that I am one that is jumping on the stamping train. There are so many uses for your rubber stamps when decorating. As seen last week with PhotoJewels she used stamping to decorate candles. Then there is scrapbooking, card making, the list can go on. So this week we are going to show you a few things that you can do with your stamps. I know I am excited and the reason being is that stamping is not something I did up in till just recently. So it will be nice to step outside of the box this week and put the fabric down for a bit. Just recently I did my first ever swap. I did a Valentine's Day Card Swap that was hosted by FaveCrafts. This was the first time I had ever used Stamping in one of my projects. I had so much fun with it. Now I am hooked. I look forward to doing more card swaps in the future. I wish I had a picture to show, however I totally forgot to get it before I put it in the mail. 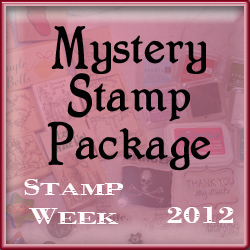 So now on to the time you have all been waiting for.This weeks giveaway is for a Mystery Package of assorted stamps. Valued at $25.00 Here are the details on how to enter into this weeks giveaway which starts now and will go through March 2, 2012 at Midnight CST. There will be a couple ways to enter they go as follows. 1. Follow us on our blog page and then leave a comment below that you are now following us or that you already are a follower of Smalltown Dreamz. 2. On a separate comment below tell us what your favorite thing to do with stamping is or your favorite line of stamps. As longs as it has to do with stamping. ****Bonus Entry**** As we have recently found out is not allowed to make LIKING our Facebook page a requirement we do feel it would benefit you to do so. This way you can get exclusive updates and join in our private games and giveaways that we do on Facebook. If you do become a Facebook Follower comeback and leave us a comment that you are now one of our friends and this will get you a bonus entry into the giveaway. The winner will be chosen by our Mr. Random and we will announce the winner Saturday Afternoon. I look forward to another great week. I love using the Perfect Pearls/Perfect Medium for a lot of my stuff! There are so many ways to use them, not only that but they give it a really awesome look to anything. Fun, easy, and nice to use!